Natural Driftwood Garland. Full of character & perfect for adding a little seaside chic to any room. Ukjoh Driftwood Sculptural Driftwood piece. 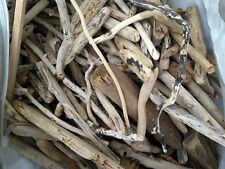 Driftwood pieces 60+ random mixed high quality for arts crafts decor etc. Long decorative Driftwood Piece . Condition is Used. DRIFTWOOD AND LITTLE HANDPAINTED BEACH HUTS WITH ROTATING BUNTING! THIS DECORATION IS ALSO AVAILABLE WITH 2 BEACH HUTS ON WOOD. THE BUNTING ROTATES WHEN TURNED GENTLY. DRIFTWOOD BEACH HUT DECORATION. SEASIDE SHOAL OF FISH ON DRIFTWOOD. Also available with blue fish and in larger shoals. DUE TO THE HANDMADE NATURE, THE ONE YOU RECEIVE MAY VARY SLIGHTLY TO THE PICTURE. Ukjoh Driftwood A Driftwood piece. SEAGULLS ON DRIFTWOOD. THE SEAGULLS AND FISH ARE MOUNTED ON WOOD. SEASIDE SHOAL OF FISH ON A DRIFTWOOD. You can rely on us for quality, efficiency and good old-fashioned service. CHECK OTHER PRODUCTS IN OUR RANGE. DORSET JURRASIC COAST DRIFTWOOD, 1 RUSTIC PIECES, WOULD MAKE STAND OR TEALIGHT HOLDER, ETC. The 16cm wooden heart has a distressed white painted finish. It is strung with 3 driftwood pieces & stone effect beads. SEASIDE SHOAL OF WHALES ON DRIFTWOOD. This is freshwater driftwood, from a lake not the sea. It is ancient bogwood from a remote part of northern Scotland. This piece and others like it, have spent countless years preserved under peatbog. Rivers wash it into the lakes and winter storms give it its smooth finish. SEASIDE SHOAL OF FISH ON DRIFTWOOD. Also available with blue fish and in smaller shoals. 40 QUALITY PIECES OF DRIFTWOOD, BEACH CRAFTS RUSTIC PROJECTS ARTS. We have a lot of a driftwood of various shape and sizes available. Driftwood 24 pieces sculptural Decorative beach Driftwood. Longest piece 35cm. Dispatched with Royal Mail 2nd Class. Made from all natural nautical materials including pebbles, driftwood and rope. We use recycled products where we can. Each one is slightly diffeerent due to the natural materials. 120cm in total length with a number of seahorses. Found on the Northumbrian coastline 2 beautiful pieces of driftwood ideal for craft or would make a decorative addition to any room. Flat Driftwood 2 pieces.